Chemistry of the Cell Interface discusses reactions involving the cells structured elements and interfacial reaction systems, which are extrapolations from the conventional methodology of solution biochemistry. The contributions to this two-volume book deal with the relationship of structure to biochemical reactions. Part A (Chapters I-V) deals with the components of complex subcellular systems, in vitro interface relationships model for lipid-lipid and lipid-protein interactions, and reaction model for chemical phenomena in systems having restricted degrees of freedom. Part B (Chapters VI-VIII) covers waters contributions to the reaction systems, the consideration of modified proteins as model reactants, and the aspects of protein chemistry pertinent to the design of interface experimental systems. 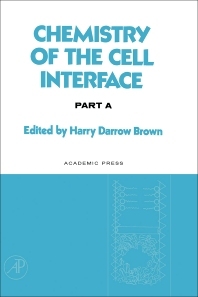 The book is suited for readers who wish to broaden their understanding in interface chemistry within the biological cell.